Have a new business you want to get off the ground? Finally looking into getting that custom sign for your established company? Studies have shown that businesses with signs stand out and get more traffic than those without signs. But what kind of sign is better for your business? 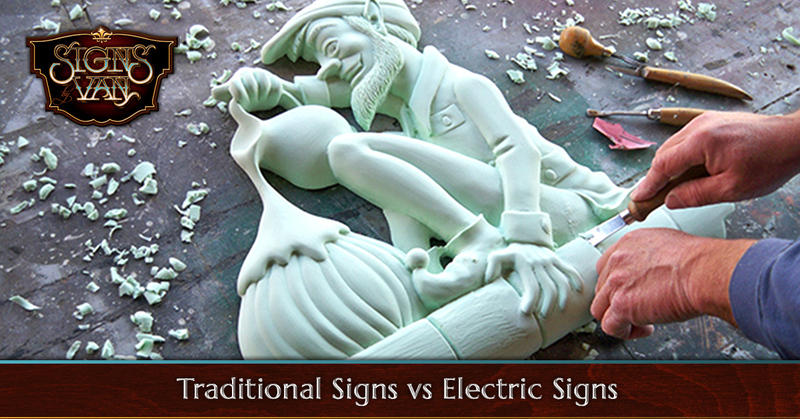 The debate boils down to two types of signage: electric signs, usually made with neon or fluorescent bulbs, and traditional signs, which are typically made from metal or wood. We here at Signs by Van have made this blog to show you why traditional wood and metal signs can be more beneficial than electric signs. Keep reading to learn why you should choose a custom wood sign over a generic neon sign for your store, business, or organization. We’ve all seen the soft, bright tones of a neon sign glowing in front of a storefront, or the dimmed bulbs buzzing behind 3D letters. Though they can grab attention and look good at times, neon signs can only go in certain areas. Most neon signs are confined to indoor areas as any kind of condensation or weathering can cause them to malfunction or short circuit. They also need a constant source of electricity, meaning you’ll need to place them near a plug or connect them to a powersource of some kind for them to do their job. On top of this, electric signs only stand out at night, meaning you’ll be missing out on about 12 hours of business advertising. Traditional signs are only limited by the space you have to put them in. They don’t need electricity, so you can put them anywhere on your property that you see fit. Their custom design and colors will stand out against any background and immediately draw attention to your business. Each sign is made with treated wood or metal, so you won’t have to worry about adding extra protection to your custom metal or wood sign either. Like most electronics, electric signs work great until they don’t. Most electric signs are made with plastic or glass, which is easily broken by the elements or a herd of grabby, unsupervised children. Electric signs that are outside or in high traffic areas will need constant upkeep, which can be quite costly. Plus, the cheaper the sign the more repairs it will require, which can be expensive depending on how intricate your electric sign is, where it’s located in your business, or how much maintenance it needs. As we stated earlier, traditional signs are made from treated wood and metal, making them weatherproof. Because traditional signs are made with durable organic materials, they’ll only require a bit of routine servicing, which will usually just be topographical cleaning. Depending on where you live, this cleaning can be once every month or so, or every other week. But for most custom signage, minimal maintenance will still allow it to last for decades on end. Because traditional signs are made with sturdy materials, repairs and replacements are minimal at most. Electric signs are customizable to an extent. You can usually get your company logo or name written how you want it; however, if you opt for the backlit sign or wording, it will most likely be lazily illuminated with a fluorescent bulb that can easily go out in a few months. Neon lights have shown that they can be made into any shape or letter, but they’re bright lighting can take away from your sign and can even make it impossible to read. Colors are heavily limited for neon lights as well as each gas encapsulated in the glass tubing burns a certain color when introduced to an electric current. And unless you protect your electric signs, they’ll be confined to protected areas where they may not be able to be fully appreciated. With a good sign maker, a traditional sign can be made into any design, whether it’s as intricate as the Sistine Chapel, or as simple as a name. Traditional signs aren’t limited by colors either, especially in today’s day-and-age where paint can be matched to any color. Custom traditional signs are only limited to space and imagination. They can also be enjoyed at night with a simple spotlight or some simple, well placed lights. If you’re looking for custom business signs in California, Signs by Van can create the custom sign of your dreams from San Francisco to San Diego. See our portfolio of signs we’ve created, learn about our Wine & Sign events where you can drink wine and make your own custom sign, or contact Signs by Van to answer any questions and get a free estimate.